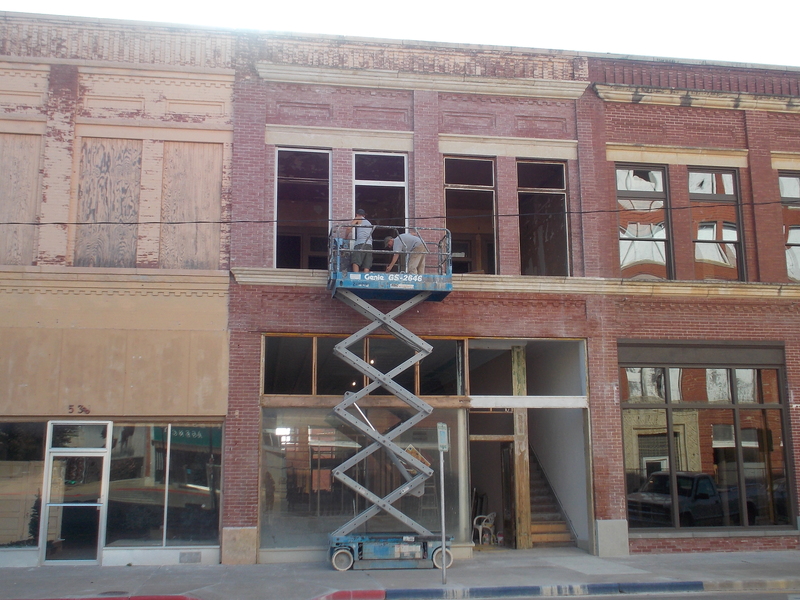 Oklahoma Preservation Society has asked Bruce Smith of Pawhuska to speak on June 4 at 3 p.m., about his rehabilitation project in historic downtown Pawhuska at the State of Oklahoma’s 27th annual Historic Preservation Conference being held June 3 – 5 in Bartlesville. “I have one of the smaller buildings in the state that’s been redone. There have been some hotels and big projects. I’m one of the few that have done a rehabilitation, and have been qualified by the state of Oklahoma to receive tax credits and receive federal tax credits through the National Park Service. Everything we did was done in compliance with a plan by the National Park Service about what would qualify…everything we did was all about telling the plumber, electrician and the contractor — the right way to do things,” Smith said. The building, located at 536 Kihekah Ave. in Pawhuska was constructed between 1907 and 1912, he said. 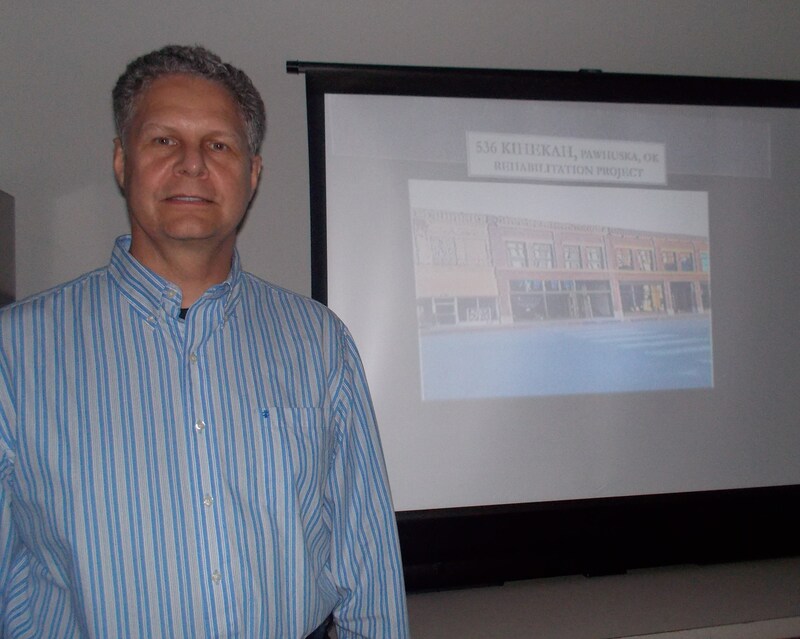 As a preview, Smith, who is also a Kiwanian, gave his presentation to members of the Pawhuska Kiwanis Club on May 27. His presentation included a circa 1900 photo of the building and the adjacent buildings on Kihekah Ave. In this photo, Smith pointed out a two-story gazebo, which is where the Triangle Building sits today, he said. He explained that oil and gas headright checks to Osage allottees were given out on the first story of that building. The Osage Mercantile was established across the street, so that Osage allottees would have a place to spend their checks, said Jenny Perrier, Smith’s Assistant on the project. Before the project began, the National Park Service required that Smith provide maps and historic photos of his building. Pawhuska Public Librarian Yvonne Rose did a lot of work to find the required Sanborn Fire maps, Perrier said. 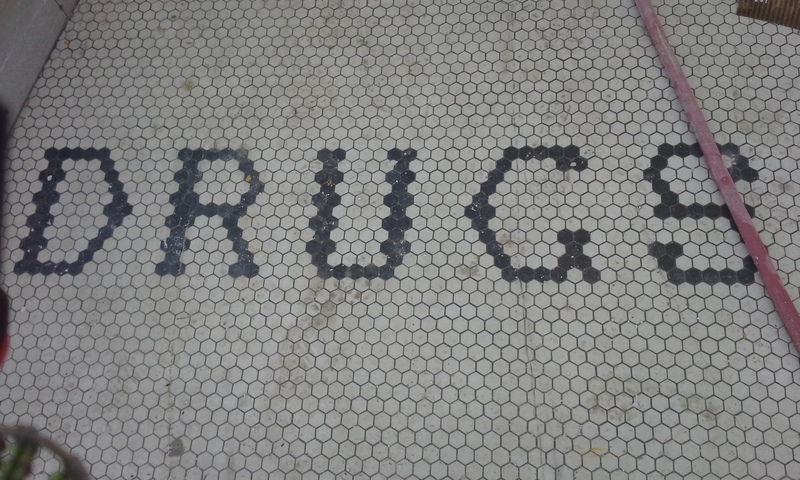 “At the building’s entrance, I left that original mosaic tile from the early 1900’s and it still says ‘Drugs,’” Smith said. Based on Smith’s research, OTASCO (Oklahoma Tire and Supply Company) was located there from 1942 to 1985. Later, an insurance company occupied the space followed by and a gift store called The Plum Tree and Stiches, which has since moved to another location in Pawhuska. OTASCO, JCPenney and several other local businesses, went out of business when Wal-Mart located in Pawhuska. Later, when Wal-Mart closed and Pawhuskans had to once again being efforts to attract small business to Pawhuska. 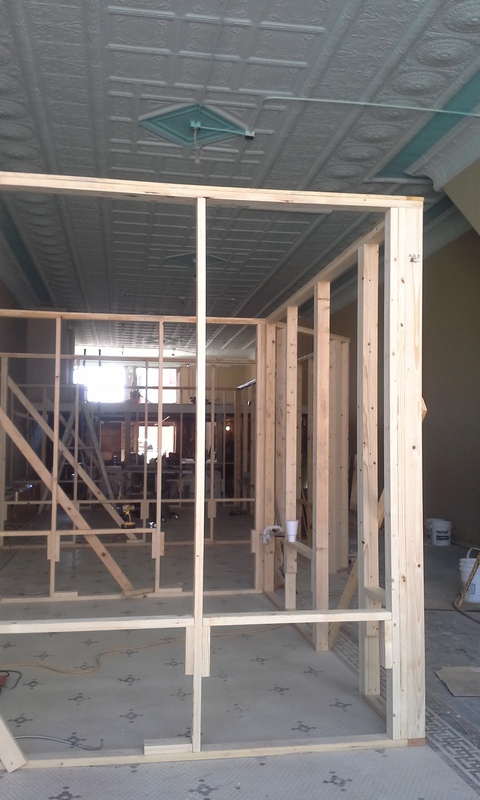 Smith hopes his renovation will contribute to economic development in Pawhuska. Smith, who is a financial advisor, has his office on the mezzanine level of the building and The First National Bank of Sedan has a production office on the first floor. Smith has room for one or two more tenants, who must pass all of the background checks, he said. The first floor has two offices and a conference room finished in oak with oak crown molding with glass partitions above that. 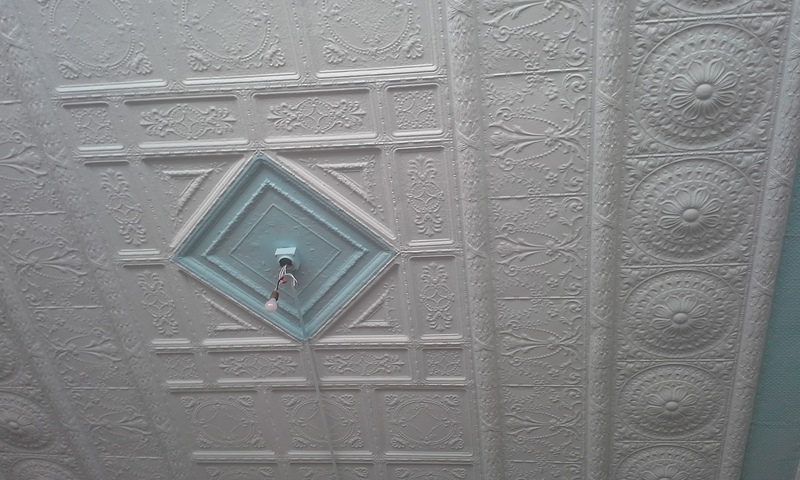 The original ceiling tiles have been restored and painted white with light blue accents to reflect additional light. Smith’s brother, who was the contractor for the renovation, Mark Smith of Mark Smith Contractors, LLC, designed a glass and wood guard rail on the mezzanine level, which allows natural light to stream in from windows on the mezzanine level. The mezzanine level had been closed with drywall, which was removed as part of the renovation, Smith explained. In 1985 the downtown area in Pawhuska was deemed to be a historic area, Perrier said. “The leg work to put the downtown on the National Historic Register of Historic Places took a lot of effort,” Perrier said. “Without a historic downtown, this type of rehabilitation wouldn’t work. Pawhuska is unique in that regard. Smith’s building is on the National Register of Historic Places along with other downtown buildings,” she added. Smith encourages the public to stop by and see the completed renovation. To register for the Historic Preservation Conference taking place in Bartlesville June 3-5, or to see a list of speakers, visit http://downtownbartlesvillleinc.org. Category: Historic Downtown Pawhuska, Pawhuska PeopleTags: Historic Downtown Pawhuska, Kihekah Ave.
← Dance Maker Performing Arts Academy Releases a New Video about their latest project!